Tea Room Mascots Celebrate 1st Birthday ! Our tea room mascots, two goldfish, Oolong and Ginger Peach, joined Oregon Street Tea Company when we switched from a tea room to a gift shop. They resided happily in a very large glass tea cup and entertained our customers, especially the children. Today they celebrated their 1st birthday! We had tea (guess what kind?) and cake. Oolong is definitely the social one. 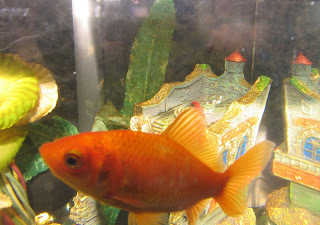 He is also the Labrador Retriever of fish; he loves to eat! He bolts to the front of the fish tank, his mouth forming that adorable sucking face indicating he’s hungry. Ginger Peach hides out in the shipwreck. She is shy, especially camera shy. 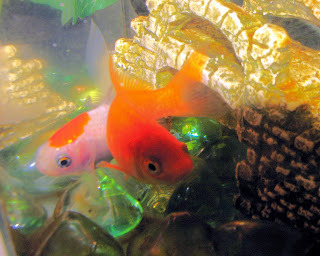 Do you know how difficult it is to photograph goldfish ? I purchased a new camera, one I can carry in my purse easily. Holding the camera for the first time, I immediately wished for a “User’s Manual” memory chip that could be inserted into my brain. No such luck. I had to actually read the manual and began to experiment. I first tried the “Sports” button. After all, the fish were fairly “sporty” rushing around their fish tank. However, close up and “Sports” doesn’t work. I tried the “Night” selection–it’s dark inside the fish tank. That didn’t work either. I tried the “Close-Up” and the “Party” selection…neither of which were successful. Finally, I settled on the “Portrait” selection and was able to capture a half way decent photo. I love my new camera, and the only store where I would ever buy a camera: Crown Camera in downtown Redding. Their website is http://www.crowncamerashop.com/. Everyone in the store is extremely helpful. This purchase comes with a free class, which I know I need…and I until I can schedule the class, I’ll sip on my Shanghai Lime iced tea and keep practicing.